Well, we woke up and did our usual coffee and internet routine and then Dan said, “Let’s go for a drive in the country.” Well, that sounded like a brilliant idea for a beautiful Sunday so of course I was all in. We got dressed and headed out toward the north. 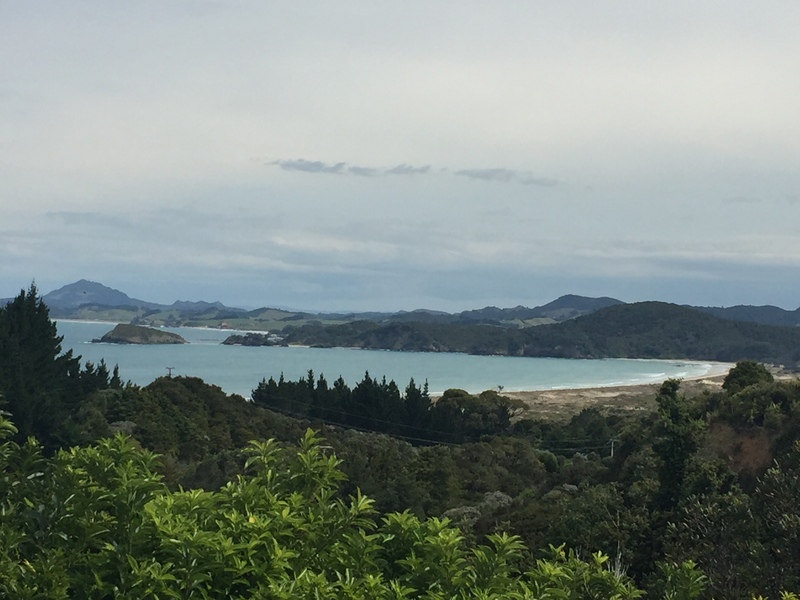 Just about an hour’s drive north of Whangarei is Opua and the Bay of Islands. Lots of cruisers make this their first stop when coming into New Zealand. We originally planned to stop there but then our friends talked us into coming to Whangarei so we were excited to see what all the hubbub was about in this northern port. You have to love the Kiwis….they just say it how it is! Of course we adhered to the instructions on the sign and made our way cautiously to the entrance of the caves. There was a small park area with some picnic tables and a building made from an old shipping container. That’s the office. Of course there’s a fee to see these caves. We’re quickly learning that everything in New Zealand has a price attached to it. We spoke to the Māori gentleman at the counter who informed us the tours go every half hour and they cost $30 NZD per person. We weren’t really all that excited about spending $60 NZD for a half hour tour of the cave so we thanked him and got back on the road. It wasn’t too long before we had made it to Opua. WOW! The sites of the bay and the islands from the main road were pretty spectacular. I can see why the cruisers like this place. It’s quaint and beautiful. That said, other than a handful of restaurants and marine related businesses there’s really nothing else here. We both quickly agreed that we made the correct choice to make Whangarei our home while in New Zealand. There we have many options for restaurants, stores and places to get parts etc… whereas Opua is pretty limited with just a couple restaurants and marine stores. There’s no doubt we want to stop here on our way out of the country but for our purposes Whangarei is definitely the right choice. We did stop in at the Marina Cafe and have a bite of lunch. The food was really tasty. I had my first “pie”. No, not a sweet pie. Here in New Zealand they sell savory pies everywhere. The look like Chicken Pot Pies. This one was chicken and leek and boy was it good. I think I’ll be having more of these tasty treats during our stay in this fabulous country. And, the view was pretty nice looking over the marina and all the boats. It was a great stop. Of course we also had to check out the two marine stores. You never know what you’ll find that you didn’t think you needed until you saw it. After a couple of hours in Opua we headed back south. It was still pretty early so we took the turn out to the Tutukaka Coast. Our fiends had told us what a beautiful place this is so we decided we should take a little side trip. It was definitely worth it. There were magnificent views of the Pacific Ocean with rocky cliffs and beige sand beaches. When we arrived back in Whangarei we decided it was too late to worry about making dinner so we stopped at the one our favorite little pubs, McMorrissey’s Irish Pub, for a bite to eat before heading back to Dazzler. They have the most amazing Guiness Stew that they serve in a sourdough bread bowl. YUMMY! It was the perfect way to end another wonderful day here in the land of the Kiwis!